RP: Yeah, and people wonder if there are overdubs on it. There really aren’t. I was using a rig where I had all the chorus and time delay on one side and all the distortion on another side so I could pan back and forth with an Ernie Ball volume pedal. Steve Morse talked about doing that sort of thing years ago. I really wanted a big guitar sound on this recording, no matter what happened. Even if I was just playing a single note or a chord I wanted it to be big. I don’t like small guitar sounds. Jazz guitar is pretty famous for having poor tone. The whole conception of tone and using that with jazz vocabulary is what I’m trying to do. Tone is a whole expression in itself and it’s a big part of what I loved about my favorite players. BM: I also liked that other cd you were on with that band Um (featuring trombonist Hal Crook, drummer Bob Gullotti, bassist Dave Zinno and keyboardist John Medeski). RP: Oh yeah, Straydog (Rope-a-Dope Records). I was hoping that album would do more than it did, but it still was good. We played at Tonic in New York and the place was totally packed. Medeski effortlessly fills any place he plays. 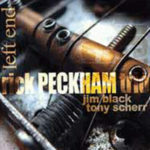 BM: This new trio of yours on Left End features a fabulous rhythm section in bassist Tony Sherr and Jim Black, who is such a musical drummer. RP: Yeah, I love these guys. I used to play with Tony down in Texas when he was at North Texas State. I was there too. And when I came up to teach at Boston, that’s where I met Jim. And so, I had never played with the two of them together until we did the record but I had played with them in different groups in each of those towns. BM: When did you go to North Texas? RP: I was down there from ‘81 to ‘85…so I was there right as (producer-composer-saxophonist) Bob Belden was getting ready to leave. It was his last year there so I got to see him some. BM: Did you attend Berklee? RP: No, never did. I got hired here in ‘86 and was hired into the ear training department, then worked in performance studies with Hal Crook and Jim Odgren. Then I got in the guitar department as assistant chair of the guitar department in ‘92. And I’ve been there ever since. BM: I’m interested in the fact that you obviously have a lot of schooling in jazz and music and yet you embrace rock music to a huge degree. BM: It’s got more to do with Billy Gibbons and Neil Young, as you pointed out. RP: Yeah, yeah, which is why I have that tune on the album called “Gibbons” and the other one called “Shakey,” which is Neil Young’s nickname. BM: …and the James Gang. RP: Oh yeah! I love Joe Walsh — James Gang Rides Again and James Gang Live. BM: So there is a part of you that is embracing that rock aesthetic as much as jazz or improvisational music. It seems like you have one foot in one camp and you’re looking around in other areas as well. RP: Yeah, that’s what I’m trying to do. When I first started playing jazz…I don’t know how I got the idea but it really seemed like part of playing jazz was that you had to hate rock. And so I sort of bought into that for a while. I bought a guitar and put strings on it that were too heavy to bend and just tried to get into Wes Montgomery and Grant Green. But when it finally came time for me to make a record I didn’t want to jump into something that would be just another jazz record, I wanted to get into the difficult work of integrating Paul Kossoff and all the great classic rock guys that I always loved. BM: And of course all those guys from that era were very experimental in their own right…rock today behind devoid of that whole thing. BM: Adventurous rock music with an open-ended improvisational thing. RP: Yeah, that’s what I want to get deeper into. BM: Of course, Scofield and Frisell dip into that hybrid thing when they play. And certainly there are many guitarists who are embracing different aesthetics in their playing. But the Grant Green-Wes Montgomery thing…that’s the cliched profile of someone who teaches in the guitar department at Berklee. BM: That’s what you’d expect of someone…so this is totally renegade material. RP: Well, that’s the idea. When I’m making a record I’m not trying to document what somebody else has done, I wanna go somewhere different. And I went through a whole period where I was going back and listening to all the music that inspired me in the first place in the ‘70s — like Ritchie Blackmore with Deep Purple and Paul Kossoff, who did all the open string tunings with Free on that great album Fire and Water. All of those albums from that era are really great. When I was in high school I would play along with the Stones’ Get Yer Ya-Yas Out and Exile on Main Street over and over again, like so many other people did. For a long time I didn’t know which one was Keith Richards and which one was Mick Taylor on Exile on Main Street. But man, I can see why Mick was angry that he wasn’t getting credit because there was so much that he was doing on that album that was really beautiful. Since then I really got into Mick Taylor and that open G tuning of his. And recently I got that new DVD with him playing with John Mayall. He sounds unbelievable on that! I think it’s the best thing he’s done since Exile on Main Street. “Left End” — That was a band that I used to go see in Cleveland, near where I grew up. And this was a band that was signed but they really didn’t go anywhere. There was a scene in that Kris Kristofferson-Barbara Streisand movie, A Star Is Born, where they go into a place and somebody has a Left End t-shirt on. That’s about as big as they made it. They had a singer who could sing like Robert Plant and a guitarist who was like Jimmy Page and even a bass player who played with his fingers, which was the first time I had ever seen that. So in its way, this band was kind of an introduction for me to some great players. “353-1001” — I wrote that for Jim Black. That was his phone number when he was living in Boston. It’s a piece in compound meters, which Jim handles beautifully. “Mr. Medium” — That’s my take on “Mr. Big” by Paul Kossoff, the Free thing. I loved that band. So here I just tried to improvise the melody and add a bridge. Playing with Tony on this piece was so great because he has such anticipation for what’s coming. He has great instincts as a player and he helps create a special band vibe. “Shakey” — I was just trying to channel Neil Young here…”Cinnamon Girl,” “Down By the River”…his approach to rhythm and tone in his voice and in his guitar playing. I think he’s really one of the great artists. I spent a lot of time growing up listening to Harvest. I just love those huge, big sounds that he gets on his solo records…that Crazyhorse sound…those big distorted things with interesting rubs in the voices. Yeah, it’s just fun to hear those sounds. “Free 2” — This is a collective improv piece just to let these guys go and do whatever they want. They’re both such accomplished players and so creative. Jim is so musical. He’s a master of color. And again, people think there are overdubs throughout on the percussion but he’s doing it all live right there in one day. “Gibbons” — When I went back and listened to all the stuff I listened to in the ‘70s, I keyed in on Billy Gibbons works with ZZ Top. His tone and melodic vocabulary is something that really resonated with all I love about the guitar. That big sound and execution of the time just really got to me. Mescalero is such a great record. And Rhythmeen is one of the best guitar records of all time, to me. I love the guitar sounds on there and what he’s doing with the different tunings. For this one I tuned down to D on the low string just as a way of starting to get that idea. I want to do more of that kind of thing. “Soporific” — Mr. Rogers said that word while my son was watching tv one day. He’s five and he was telling me about soporific, and I had to look it up. It means “sleepy” and that’s sort of the vibe of this one. “You Know What That Means” — I wrote that for the Hal Crook band. Right before that record came out with Hal I mentioned to him, “You know that record’s coming out pretty soon and we’ve been getting more people watching us every week. Things look like they’re going great.” And he said, “You know what that means.” So I wrote the tune around that vibe. “Hammer Damage” — I was in a new wave band during the ‘80s called The Lines and I think we warmed up for Hammer Damage once. I just think it’s a great name for a band. There were some terrific bands in Cleveland in the late ‘70s and early ‘80s. I wish I would’ve been following Jamey Haddad and Joe Lovano and Bill DeArango and those guys playing around Cleveland at the time I was growing, but I really was following all the different rock bands around Cleveland and then eventually playing in one that didn’t do very much. But Hammer Damage was another one of those great Cleveland bands. “Hawthorn” — I wrote this and recorded it with Jim Black on Human Feel’s first record, which I’m told is something of a collectors item around the world today. It was a tune that Jim hadn’t played since then and I hadn’t played it much either since then so I thought it would be a fun thing to do again. And it shows that I was a lot more ready to play it this time than the last time. “Real Time” — I was trying to get more of an African 6/8 backbeat on this tune. And I was trying to get different times over the top of it, a la Jeff Beck. I love Jeff Beck. I think he just keeps getting better and better. He reminds me of Joe Henderson or Scofield or Abercrombie…these guys just keep getting better every time you see them. “Free 1” — This is another collective improv piece that really highlights the interactive nature of this trio. Jim sounds great here. He’s such an amazing musician. “Evidence” — I taught a Thelonious Monk course at Berklee for about ten years. This particular tune kind of boils everything down that Monk did rhythmically and arrangement-wise…that idea of using the melody all over the place. I saw Steve Lacy once playing that tune solo and he said that that is THE Monk tune. So I figured if I was going to do one, that would be it. I’ve always loved playing Monk’s stuff.